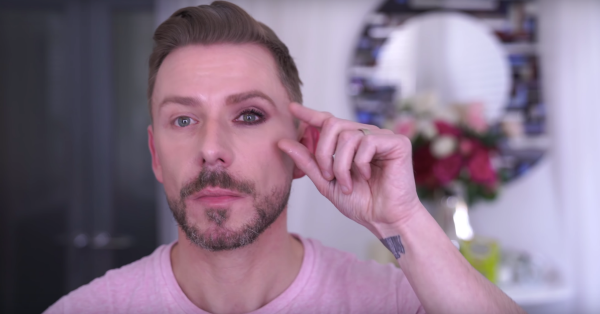 Wayne Goss's Eyeshadow Tutorial For Small Eyes Is The Best Thing That’s Ever Happened To Me! If you are a makeup enthusiast, a budding makeup artist or just somebody trying to perfect their makeup skills...I highly encourage you to sit down one day and binge watch Wayne Goss's makeup tutorials. Every KEY trick I have learnt over the years about perfecting makeup has come from Wayne Goss. His tutorials are simple and absolutely effective, no matter what part of the world you're watching from. Simple tips, without the fluff. Wayne recently posted an eyeshadow tutorial on his YouTube channel that's meant for small eyes. It's definitely been a game-changer for me. If you too have struggled with applying and perfecting eyeshadow, I'm sure it's going to make the process easier for you too! - Set your eyelids using a translucent powder. This will absorb any excess oil and help your eyeshadow glide on easier. - Place a makeup brush flat against your eyes. Place the brush along your cheekbone to trace the inner corner of your eye to the tail-end of your eyebrow. Use this as a guide for your eyeshadow and you'll never go wrong! As a general rule, don't apply eyeshadow outside of this area. - Look straight ahead into a mirror and using a crease brush, place some eyeshadow into your crease. Stop once you hit the middle of your eye. Place the same eyeshadow colour on your lower lash line, drag it all the way in and connect the two lines. This is the perfect way to get your eyeshadow 'shape' right, every single time! - Use a fluffy brush to blend away any harsh lines. - Using the small crease brush and the darker eyeshadow again, brush on some eyeliner. It doesn't have to be perfect! Using the fluffy brush, blend out the harsh lines. Add some more shadow along your lashline and in your crease and blend again! - Add a shimmer shade to the centre of your eyelid using your fingers and that's it. Pop on some falsies or add some mascara to finish off the look! This is hands down the best, easiest eyeshadow tutorial. I just gave it a shot and I'm very impressed with how professional my eyeshadow looked! Need a tutorial on eyeshadow brushes? Click here. Looking for some tips to get your eye makeup basics in place? Check out this post!